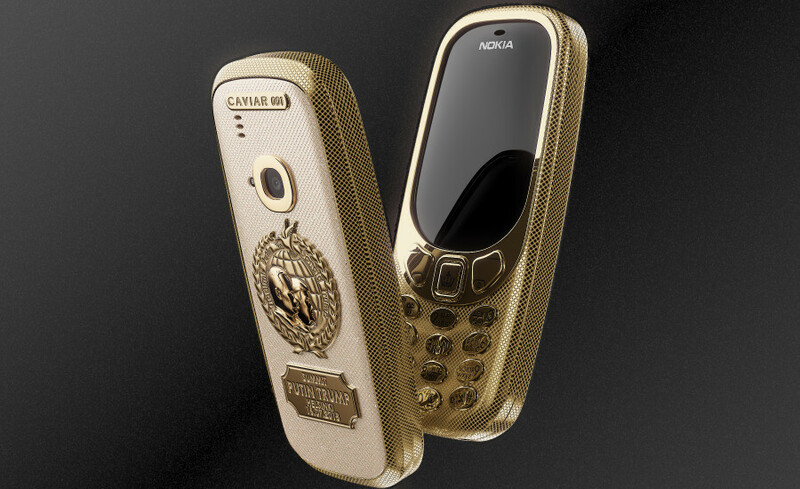 Meet the "Peacemakers", a Nokia 3310 made of titanium and featuring a 24-karat gold ornament depicting the portraits of Vladimir Putin and Donald Trump looking in the same direction, which is a rather uplifting symbol given the importance of the high-profile meeting. The titanium of the phone has been fully covered with gold by using a PVD (Physical vapor deposition) technique which promises even greater resistance to corrosion. As an added bonus, the gold film adds a neat chrome-like overall color of the handset. But that's not all: even the d-pad button at the front of the Nokia 3310 is engraved with a decorative crown, because of course it is. Kitschy and garish, but we do admit it looks kind of cool. So, what about the pricing? Well, all things considered, the price tag of 162,000 rubles (around $2,610) somehow doesn't strike us surprising, not at all. It's clear that this device is aimed at eccentric millionaires and Russian oligarchs with questionable taste in gadgets. 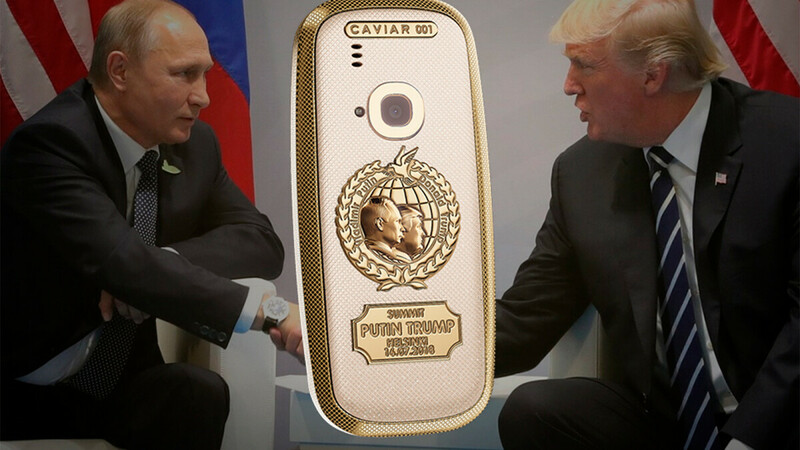 Caviar doesn't say how many of the Nokia 3310 Peacemakers edition will be produced, but it's already revealed that the first two units will be gifted to Trump and Putin. Its probably just me... Definitely just me but; It seems like Vladimir Putin is standing 'right' behind Donald Trump... In an 'informal', LGBT way! Sorry, just can't help myself sometimes! Especially when I'm mild drunk... And I apologize in advance to anyone who find this remark offending. I might have center-left political beliefs; but I respect both sides and it has nothing to do with my political perspective. Its merely an observation. G'Day! It wasn't a very astute observation. Puppeteers always stand "right" behind their puppets. Drunk or not, you should know this. You're absolutely right; I 'should' know this! What was I thinking? In any case; I'm glad we finally agree on something! It's not a summit, it's a performance review. Putin is telling Trump what he needs to do to improve his performance in service to Russia. Though, there's not much to criticize, he's advanced Russian interests like no one before.